KENNICOTT, JULY 1997 - On a cloudy morning, I went to the old powerhouse in Mc. Carthy. This site is now used as the home base of the St.-Elias-Wrangell mountain guides. There I adapted a pair of crampons to my hiking boots and signed the paper declaring 'guides are not responsible for eventual accidents', as is usual in most cases when there is little bit of danger attached. I surprisingly could pay for the hike (in advance) by credit card. We took the van that operates between Mc. Carthy an Kennicott village (only a few miles away) and then walked on together with our guide along a small path leading to the Root glacier. 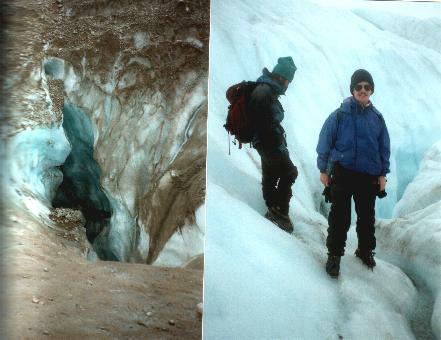 Once on the glacier - after we had attached the crampons to our boots - the glacier experience could start. Since this was my first glacier walk ever, I had to practice walking with crampons a little at first, but after a while this was an almost 'natural' way of walking. The 'landscape' on the glacier is absolutely fabulous. 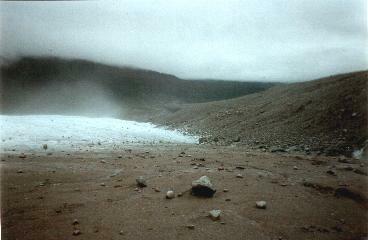 There are steep descents, crevasses, 'moulins' (melting water running into a hole into the glacier),... It's really amazing to stand on the edge of some crevasse or to walk on narrow edges. Having a pick-nick on a glacier is also something special ! After a while you really loose every feeling of orientation, especially when it's a little misty, but our guide knew this glacier very well. What struck me also are all the shades of blue, white and gray... At some point we came into some natural amphitheatre made of ice,... this is really a trip into some other world.